Electrochromic displays are made from materials in which the transmittance of light to be adjusted by applying a voltage. These work similarly to LCDs by letting light from a backlighting unit (BLU) pass or not and so show desired images. These kind of displays haven't been commercialized successfully yet due to fragile materials and material mismatches with the electrodes. But this may change now, thanks to graphene. 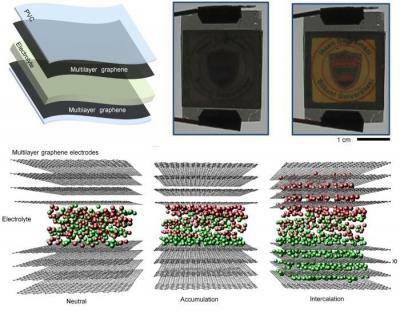 Researchers at Bilkent University developed a graphene electrochromic device that demonstrated 55% modulation and a broad spectral response. Both the electrode and the electrochromic device are made from graphene, and this enables a high percentage optical modulation, optical tuning properties in the UV to infrared, good electrical conductivity with no material mismatches. The display is mechanically flexible. To make this device, the researchers deposited multilayer graphene on nickel and copper foils and then laminating with PVC at 120 degrees Celsius. An electrolyte liquid was sandwiched between two films of graphene on PVC. The researchers say that switching the device on and off 100 times did not cause any degradation - but only at low-frequency. High-frequency switching or leaving the device on for long periods led to some deterioration in performance. It's not clear if this material is suitable for actual displays, but it may be possible to use it for applications such as smart windows or reconfigurable mirrors.